Mix ingredients in blender with ice and blend thoroughly; Pour into graham cracker-rimmed highball glass and garnish with a sprinkle of cinnamon. In a cocktail shaker filled with ice, combine all ingredients except the banana. Shake vigorously. Strain into a martini glass. Garnish with 1/2 banana sprinkled with cinnamon, and a mint leaf. In a cocktail shaker with ice, shake vodka, apple schnapps, butterscotch liqueur and half and half. Strain into a martini glass that you have drizzled with caramel sauce. Garnish with an apple slice. 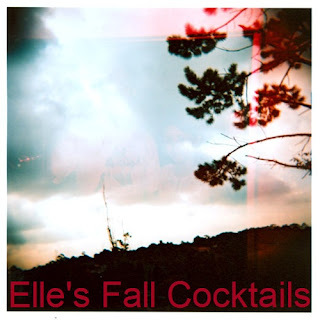 What are your favorite fall cocktails? Which of these would you try? ps: I am hosting a really sweet GIVEAWAY later on today, so please join in:) ...I bet you will love it!!! Caramel apple martini now, please. Ok so its a little early - but it sounds amazing! Oh my gosh, the pumpkin pie sounds SO GOOD. mmmm pumpkin pie for me! the minute I turn 21 Im going out and buying the supplies to make this lovely cocktail. I love fall so much more than summer. I love fall drinks! My favorites are carmel apple martini and I make hot apple cider with dark rum. It is perfect in a thermos for tailgating! These sound yummy although I don't drink! The pumpkin pie one sounds AWESOME!! Mmm, I can't pick a favorite, but maybe that pumpkin pie :) These all look so D-lish and perfect for fall! I'm such a bore with my cocktails and usually stick with a Cuba Libre or Mojito. All of these look delish! Drooling over these! Must try one just for fun! So many tasty beverages!!! I'm definitely gonna try the pumpkin pie one at some point, love pumpkin so much. YUM! Sign me up for a Maple Fireside Nightcap or a Caramel Apple Martini! !